Your Pitt Panthers are proudly sitting at position #6 in the Eastern Region!! It’s great to see our hard work paying off, but we’re not satisfied yet. Read about how PWH's captain, Jackie Sharp's, unparalleled love for the game of hockey has propelled her through her college hockey career and has left a lasting impact on the young program. As a new face on the ACHA stage, the Pitt Panthers are proud to ranked among the Top 10 for the ACHA Women's Division II East Rankings: once as the #7 seed and ending at #8. The Pitt Panthers are optimistic for the 2018-2019 season as they contend for the National Tournament. Great season girls and hail to Pitt! Read about the founding of our program and the motivation that has carried us through. In their final regular season game, the Panthers took home a victory after beating the RIT Tigers 2-1 on Saturday at Shady Side Academy. They also honored their senior captain, Jackie Sharp before the game. Sharp has been with this Panther’s squad for two years and was a founder of the team before she was named captain. When we spoke after the game, Sharp was emotional as she emptied water bottles outside the locker room. “I’m gonna cry. I think that having gone from a founder, playing goaltender, to being named as captain…our team, we were awful last year” said Sharp. This year’s team had to find a way to work together and become a cohesive group in order to put more points and goals up in order to contend with other schools. That work did pay off in some respects. “Obviously I wish things would have went a little bit better in certain ways but the fact that we made the playoffs after one year, was absolutely phenomenal.” Said Sharp. Those playoffs as of now will be the College Hockey East Playoffs in Indiana, PA March 3-4. The Panthers will face off first against Delaware. Sharp sees the future as a bright one with ongoing recruiting, hoping that the program can advance to a Division 1 team as well as move towards becoming an NCAA team as well. The Panthers fell 2-0 to the Mercyhurst Lakers on February 4th, but Sunday’s game was also a chance for the team to honor the memory of Alina Sheykhet and bring awareness to victims of domestic violence. Sheykhet, 20, a junior at Pitt, was killed by her ex-boyfriend in October 2017. Panthers forward Marissa Oakley was one of Sheykhet’s roommates in Oakland, only a short distance from the University of Pittsburgh campus. For Oakley, this Sunday afternoon game meant the world. “It meant a lot. Because when I lived with her she was always super, super supportive of me playing.” Sheykhet was always asking questions about the games and offering her support to Oakley and the rest of the girls on the team when they had games to play. “She was always the first one to tell me ‘hey good luck,’ like as soon as I had my warm ups on she was asking ‘Oh who are you playing? What are you doing? Where are you going?’ and asking all these questions even though she knew nothing about hockey,” says Oakley. The team collected donations during the game towards a fund for Sheykhet and her family and a held a moment of silence after the starting lineups were announced in a joint effort with Mercyhurst at center ice to honor Alina, as well as all victims of domestic violence. The No. 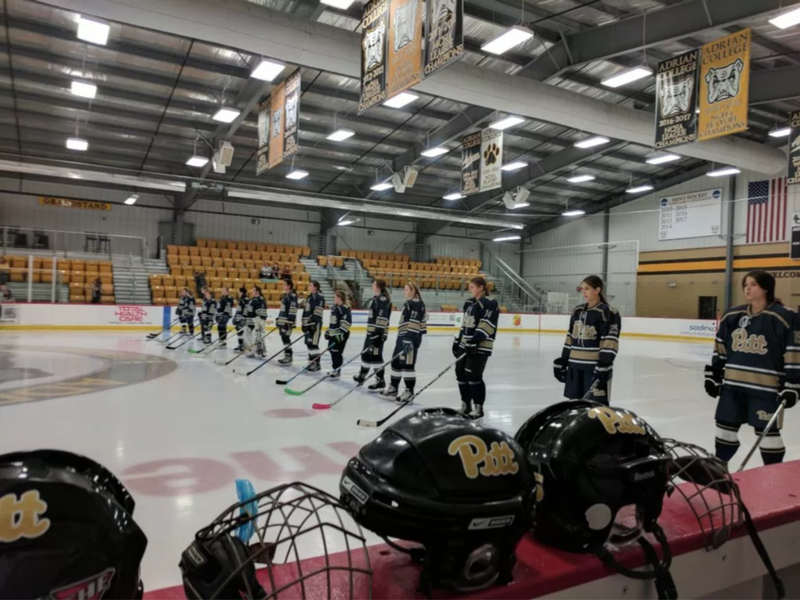 7 ACHA ranked Pittsburgh Panthers women’s hockey team held on to beat the University at Buffalo Bulls 3-2 in overtime after being held scoreless for two periods on Saturday night at Shadyside Academy in Fox Chapel. The Bulls struck twice in the first period, forcing the Panthers to regroup during the first intermission. The Bulls’ first goal came from Maddie Norton, assisted by forward Mamie Talty. With six minutes left in the first period, Pittsburgh forward Dana Julian received a hooking penalty, leaving the Panthers shorthanded. The Bulls scored their second of the period while on the powerplay thanks to Sarah Sauda on defense, with another assist by Talty. Both teams were held scoreless during the second period. Panthers goalkeeper Katie Pucci faced 12 shots on goal while Bulls goalkeeper Theresa Meosky faced only four. Buffalo’s Lynn Copeland took the only penalty of the period for hooking. Pittsburgh battled back for the third period, scoring two goals to tie the game. The first goal was scored by Natalie Foster, unassisted within the first three minutes of the period. Forward Shannon McCafferty had the second goal of the period for Pittsburgh with nine and a half minutes on the clock to tie the game 2-2. Foster assisted on the tying goal. Pucci kept the game alive for the Panthers with an incredible blocking save on a Buffalo breakaway. Pittsburgh’s second penalty of the game was served by forward Ailish Fallon for tripping. Forcing overtime against the Bulls, the Panthers had several scoring opportunities though no pucks found the back of the net until the very last second of the game. Pittsburgh’s game winning goal was scored by defenseman Bre Doherty with 0.02 left in overtime. “I saw like, Nat (Foster) chip the puck up. She said afterwards she was trying to ice it but I just saw it. And I know I’m fast, so I just went for it. Their defense was tired, I knew that,” says Doherty of her overtime goal setup. 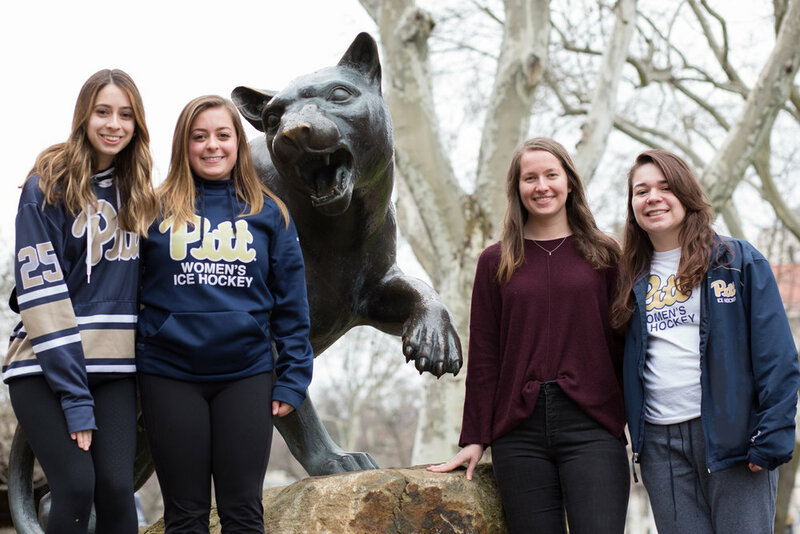 Read about what Pitt Women's Hockey means to our players and our coaching staff in this feature of the Pittsburgh Hockey Digest. The Pitt Women's Ice Hockey team had two match-ups this past weekend with CHE divisional rival RIT. Pitt jumped out to an early lead with a first period goal scored by #66 Sara Lozito (assisted by #4 Shannon McCafferty), which was followed minutes later with another goal by #24 Emma Embar (assisted by #20 Ailish Fallon). These would be the only goals scored until the 3rd period when RIT would sneak a short-handed goal in on a wrap-around. However, after this the Pitt girls stepped it up on defense and pulled out the win. Looking to get a jump on the second game of the weekend, Pitt opened up with 3 goals in the first period. #66 Sara Lozito had 2 goals (unassisted and then assisted by #12 Bre Doherty), her second and third of the weekend, while #24 Emma Embar notched her second goal in as many games (assisted by #48 Sarah Rogers). Not even a full minute into the second period, Bre Doherty would score to expand the Panthers' lead to 4 (assisted by #3 Marissa Oakley). Not to be outshined by the offense, the Panthers defense really stepped up as well and held RIT to only 12 shots the whole game. Goalie Katie Pucci was up to the task and made all 12 saves to record her second shutout of the year. This completed the girls' weekend sweep. This weekend brings Pitt Women's Hockey to a record of 6 - 4 overall and 5 - 0 in the division. Their next games will be away this weekend (11/17 and 11/18) against Mercyhurst. The Pitt Women's Ice Hockey team played their first home game last weekend with a game against California University of Pennsylvania. The girls played very strong defensively and goalie Katie Pucci was flawless in the shutout win. The lone Panther goal was scored by #14 Stephanie Toole, her second of the season! After two tough losses to Navy, it was great to see the Panthers rally back at full force. This big win makes the team 1-0 in the division and 1-2 in the conference. This coming weekend (10/27 and 10/28) the girls will have 2 more match-ups against Cal U at the Rostraver Ice Gardens. Any girls interested in being a part of the team for the 2017-18 Season should attend the "Team Information Meeting" on Monday (8/28) at 9 P.M. in the Cathedral of Learning, Room 219. Tryouts will be held on Wednesday (8/30) at 6:10 A.M. at the McKnight Arena on the Shadyside Academy campus. Pitt Women's Ice Hockey is proud to announce that our players, Elena Cimino, Nina Cairns, and Lindsey Gorman all made the cut for the ACHA Women's Division 2 Academic All-Americans list! We take pride in our ability to perform well in the classroom and on the ice and are happy to see our girls so successful in their endeavors. We congratulate all of our girls on their successes and look forward to all the amazing things their futures have in store! Hail to Pitt! We're so excited to announce our entrance into the College Hockey East League for the 2016-2017 season! We will be facing SUNY Buffalo, California University of Pennsylvania, University of Delaware, Liberty University, the University of Maryland, United States Naval Academy, The Rochester Institute of Technology, and West Chester University.